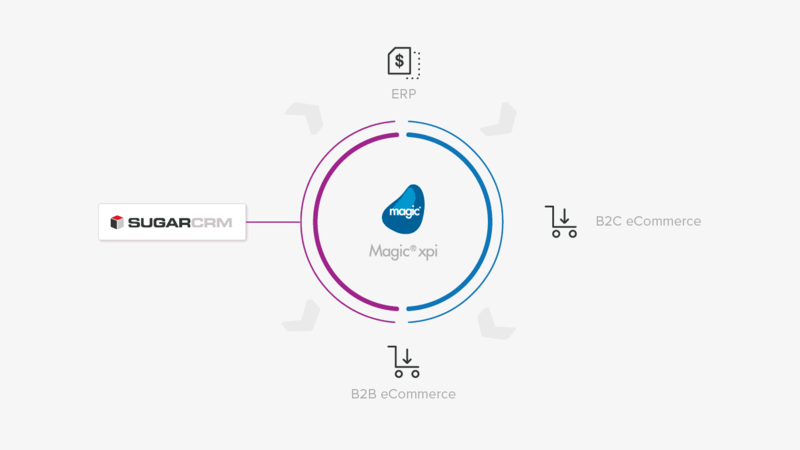 "Magic xpi Integration Platform is exactly what we were looking for — a solution to help us quickly and cost-effectively streamline our integration of our ERP system and other information management systems, including Sugar, a B2C eCommerce platform and our B2B eCommerce platform." Bishop-Wisecarver Group, who helps manufacturers and automation solution providers engineer linear and rotary motion products, sought to build a solution where all transactions and updates are consolidated into their ERP system and outputted to Sugar to be viewed by various departments, including sales reps. The projects involved the bidirectional exchange of data between the ERP system and Sugar, the B2C eCommerce platform and the B2B eCommerce platform for motion systems. Magic xpi was selected due to its product strength and the depth of knowledge and experience of the Magic integration specialists. Magic’s pre-built connector for Sugar and Magic’s ability to connect to any third party system enabled an easy development and quick deployment of the project. With its new centralized integration system based on Magic xpi, Bishop-Wisecarver Group has achieved greater visibility into sales and has made external reps more productive, empowering them to independently carry out tasks that previously required the assistance of a Bishop-Wisecarver Group employee.